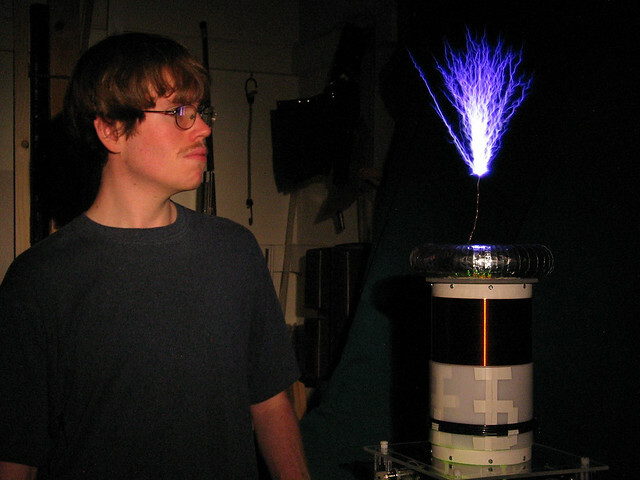 Elysium is, certainly, my finest Tesla Coil yet. Not because it’s big (it isn’t! ), nor because it employs some revolutionary drive topology (it doesn’t), and (sadly) not because it can play the music from SMB world 1-2 (a future upgrade, perhaps). Rather, because it’s done, it works, and it looks good. 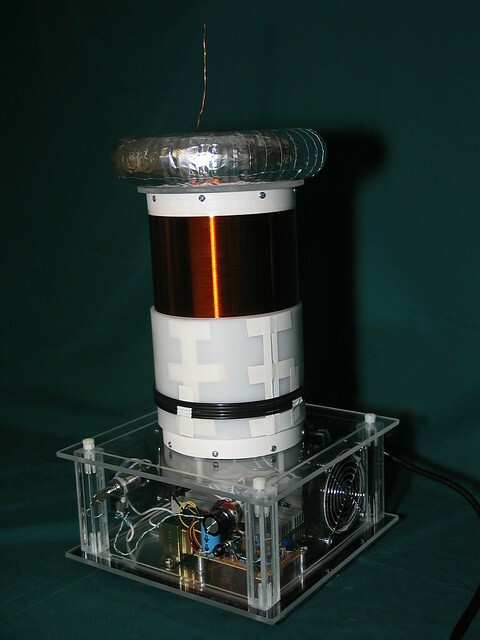 Also, I should note: it was designed and built in under a week; just prior to heading off to WSU (and moving into a decidedly cramped dorm room), I decided that I wanted a Tesla Coil that I could actually bring along. My prior creations didn’t exactly fit the bill. Thus, the Elysium project was started. 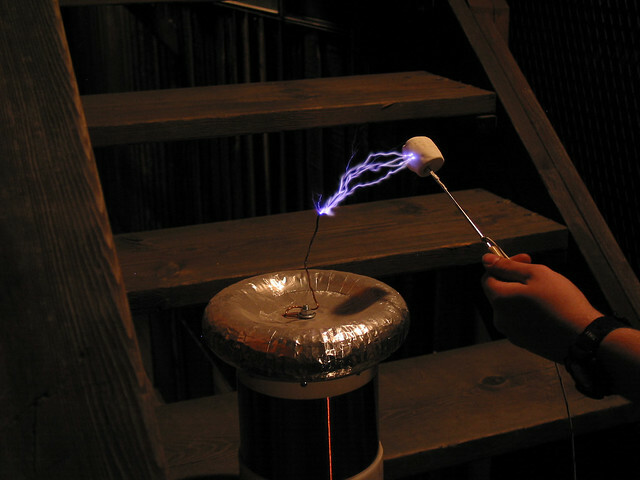 At least three of which, quite succinctly, pointed to a more conventional solid-state Tesla Coil. While dual-resonant SSTCs (like Nimiety) are truly impressive, and you can actually build them small, they certainly aren’t quiet, and their power transistors have an unfortunate tendency to explode at the most inopportune times (a side-effect of putting them in series with a resonant tank circuit that generates kilovolts at kiloamps? quite probably). There still, however, remained the question of a drive circuit. Much pioneering work on early SSTCs was done with nothing more than a fixed-frequency oscillator operating near the secondary coil’s resonant frequency. Richie Burnett’s SSTC is a prime example of just such a coil. My first SSTC – Inchoate – started its life with a driver derived from Richie’s design, and was well-served by it. Fixed-frequency drivers may be simple and robust, but their performance is easily hampered by de-tuning; anything brought into proximity of the coil can skew its resonant frequency enough to dramatically shorten (or even extinguish) its streamers. Even the streamers themselves can change the resonant frequency, effectively artificially limiting their own length. Clearly, this would not do. Drivers with feedback were the next evolution in SSTCs. Jan Wagner and hvguy popularized the antenna-based feedback driver. Many exceptional SSTCs have been derived from this design – even a twin SSTC! 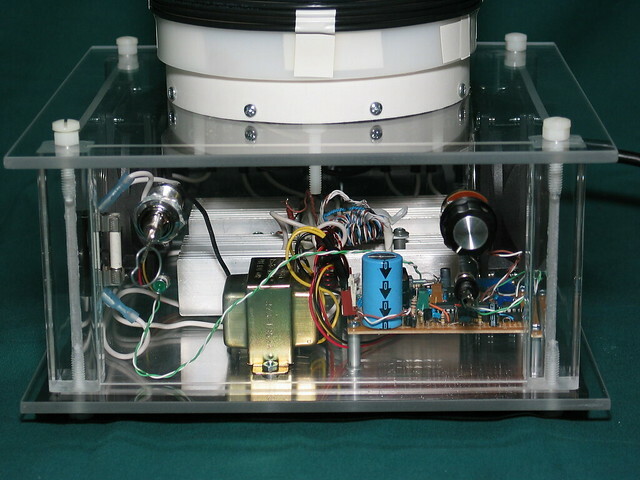 Inchoate was ultimately upgraded to this design as well, and managed up to 25″ streamers with it (quite a lot for a conventional SSTC). So, then, this would seem to have been the obvious choice. Not quite: my personal experiences with antenna feedback were not all positive; I lost many good ‘FETs to misbehaving feedback circuits, and was not anxious use this circuit as a basis for a highly reliable coil. A new option had recently emerged. Steve Conner had developed a driver that, seemingly, combined the best of both worlds: a robust fixed-frequency oscillator – and a flexible, detuning-immune feedback circuit. A CD4046 PLL made this possible. To limit power consumption and component heating, I took a page from John Freau’s VTTC book, and added a staccato controller to the design. This had the additional benefit of allowing the SSTC to turn-on synchronously with the zero-crossings of the incoming AC power, thus allowing the coil to operate reliably without a heavy variac present to slowly raise the input voltage. The second doubt is about the use of LM311 comparator. As per the diagram, You are giving “filtered” 25V DC to non-inverting input of LM311. If You are using LM311 for synchronous starting with zero crossing of AC mains cycle, is it better to be connected before filtering the 25V DC? Third doubt is in the power electronics schematic. There You have used a 30A hyperfast diode for AC mains rectification. As the mains frequency is only 50 or 60Hz, is it possible to use a slower diode there?